"I don't want to have lived in vain, like most people. I want to be useful, or bring enjoyment to people, even those I've never met. I want to go on living, even after my death. And that's why I'm grateful to God for having given me this gift, which I can use to develop and express all that's inside me." We've seen her picture, read her diary, and probably quoted her famous phrase about the inherent goodness of mankind. We've marveled at her poise and maturity, revered her unique view of World War II and the Holocaust, and all but sanctified her memory. In short, we feel as if we know Anne Frank intimately. Filmmaker Jon Blair, however, proves we don't, and his thoughtful, probing, and often moving documentary, Anne Frank Remembered, delves beneath the tragic teen's immortal journal to present the untold history of the Frank family and the devastating times in which they lived. Right from the start, Blair makes us realize how we've come to take Anne's image for granted, subconsciously dismissing her as a little more than a poster child for discrimination, intolerance, and the horrors of war. Yet through vintage photographs, archival footage, and interviews with friends and acquaintances (including extensive recollections from Miep Gies, the family's protector and only link to the outside world), he resurrects and humanizes Anne, allowing us to see her�possibly for the first time�as more than a symbol of thwarted youth. When viewed in conjunction with George Stevens' dramatic interpretation of Anne's diary, Anne Frank Remembered presents a vivid portrait of a normal girl, whose extraordinary circumstances and burgeoning talent thrust her posthumously onto the world stage. Narrated by Kenneth Branagh, with diary readings by Glenn Close, the film begins with an in-depth examination of Anne's life before her well-documented confinement in Amsterdam. We learn the Franks were not Dutch, but German, and proud Germans at that. Otto Frank even fought for his country (and served as an officer) in World War I. "Prosperous, sophisticated, cultivated, and integrated," the Frank family enjoyed an existence far different than the "ghetto Jews" depicted in the xenophobic Nazi propaganda film The Eternal Jew. The rise of Hitler, however, prompted the Franks to leave Germany in 1933, when Anne was four years old. Relatives already had fled to neutral Switzerland, but Otto chose Holland because of prior business connections, and the Franks settled in a modest apartment complex in central Amsterdam. Remembered as naughty, spoiled, and impertinent, a very young Anne enjoyed being the center of attention and actively sought the spotlight. Sadly, the encroaching war ended her idyllic childhood. Once the Nazis rolled into Holland, they began subtly and systematically restricting Jewish rights and freedoms. When German authorities selected Anne's sister Margot to be deported to a labor camp, Otto Frank moved his family to what would become their legendary attic hideaway. Although many believe the family's "disappearance" was frantically engineered on the spur of the moment, Otto had been preparing the refuge for two years, stockpiling food, clothes, bedding, and other supplies. Shortly before their confinement, on her 13th birthday, Anne received her cherished diary as a gift. The film addresses the two years spent in hiding, but doesn't dwell on them, as they are well-documented in Anne's diary. We do learn from Miep Gies that Mrs. Frank suffered frequent bouts of depression, and a recalcitrant Anne was not particularly sympathetic, often writing about her strained relationship with her mother in shockingly blunt and unforgiving terms. Perhaps the most fascinating�and wrenching�part of the documentary chronicles the months following the family's capture. Deported together, but soon separated, the film charts their respective odysseys through a maze of concentration camps, detailing their humiliations, illnesses, horrid living conditions, and tragic fates. Reminiscences from those who shared the experience and survived add impact and immediacy to the cold facts. 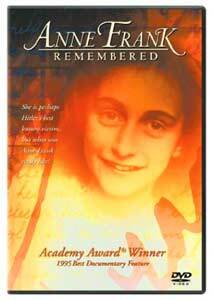 Winner of the 1995 Academy Award for Best Documentary Feature, Anne Frank Remembered wisely refrains from making sweeping judgments about its subject and never lapses into sentimentality. In typical BBC fashion, Blair's tone is straightforward, often dry, but the resonating words of the interviewees tug at our emotions. Blair deserves commendation for recording so many firsthand experiences, with the memories of Miep Gies, who visited the Franks daily in their secret hiding place, remaining especially vivid and riveting. Her participation in the film lends Anne's oft-told story a sobering reality and tender intimacy it has never quite achieved before. Image Transfer Review: The transfer is surprisingly clean, yet possesses the gritty texture so typical of documentary films. Colors and fleshtones are well rendered, and archival footage is seamlessly integrated into the movie's fabric. Audio Transfer Review: The Dolby Surround track enjoys nice presence and depth, although stereo effects are subtle at best. Branagh and Close both possess marvelous speaking voices, and their impeccable diction makes every word clear and comprehendible. Despite less than optimal recording conditions, no distortion or surface defects could be detected. Extras Review: A few trailers are the only disc supplements. Anne Frank Remembered masterfully paints one of World War II's most tragic and inspirational figures as a human being, not a saint, and revives her dormant legacy in a unique and totally successful manner. Filmmaker Jon Blair allows those who knew Anne to tell her story, and through their recollections we gain renewed appreciation for her courage and spirit, and fresh insights into a horrific period in world history. Recommended.